For Sharon R. Houck, the art of transforming a home—from ordinary to extraordinary—begins not just with what she sees but also with what she hears. This elegant and effective approach stands as a major reason Houck has been an in-demand interior designer for more than 25 years. Whether a client intends to transform a dated living room or embark on a full-scale, whole-home redesign, Houck begins by gathering information about the client’s vision, down to the smallest detail. Maybe the client is interested in an Old World look for the bedroom. Or maybe they wish to update an antiquated kitchen to a modern design with clean, crisp lines, a simple colour palette and the use of elemental materials such as glass and metal. Or perhaps they’ve decided on mid-century modern for the living room, a throwback to the design style of the 1950s and 1960s, blending functional and fashionable. No matter the request, she’s happy to oblige. 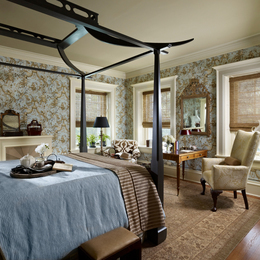 Sharon R. Houck Interiors Inc. offers the gull gamut of design services from concept to completion, to fit every budget and design challenge. From full-scale home design and outdoor space planning, to lighting plans and custom furniture/cabinetry, and everything in between, the firm always ensures the client’s complete satisfaction with the end result. Whatever the client’s preference, the designer fuses their ideas with her own, and then presents her vision to the client. Often, after seeing her vision brought to life, a client’s initial desire to transform only one room—a bedroom, the living room, the kitchen—expands into a full-home redesign. Regardless of the project’s size, the process is seamless. She visits the home, listens to the client’s ideas and answers their questions. After taking photos of the space to be transformed, she creates a floor plan, selecting different elements for the room based on a multitude of factors. If a client has an idea that in the designer’s mind doesn’t quite work with the space in question, she will present them with design principles to give them a better understanding of what may work best. While Houck is formally educated as a designer—she holds a Bachelor of Fine Arts degree from the Moore College of Art & Design in Philadelphia—she possesses an innate sense of style that was evident at a young age. As a child, she decorated her own bedroom with her younger sister, Debbie, who later became a floral designer. Debbie died in 2007 at the age of 52, and Houck paid tribute to her sister the best way she knew how. Style. Attention to detail. Sensitivity. Comfort. Functionality. Houck balances all of these qualities when turning a client’s vision into reality.